The 2014 "Annual G-Men Gathering" took place Friday, June 27th in Lake Charles, Louisiana. For two days, former Grambling College/Grambling State University football players, supporters, and friends celebrate their loyal dedication to Grambling football and Coach Eddie G. Robinson. Two days of good seafood and strong camaraderie is what they all come for. At this year's event, Friends President Wilbert Ellis introduced Grambling's new head football, Broderick Fobbs as the main speaker at the Lydia Event Center on Saturday. Also, Coach Rob's longtime secretary, and museum Friend Jackie Newsome received an Appreciation Award. 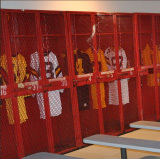 The G-Men Gathering was founded by former player Richard H. Lee when he gathered with a few friends in his backyard. 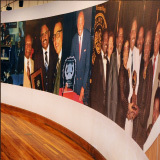 Numerous individual donations were made to the Eddie G. Robinson Museum. As always, Thanks!